The bludgeoning sounds of the royal drums. The intermittent sounds of ecstatic Rwenzuru loyalists-and the thousands of guests, who thronged the Golf Course grounds in Kasese District to commemorate the 50th coronation anniversary of King Charles Wesley Mumbere,of the Obusinga Bwa Rwenzururu, on 19th October 2016,created a spectra of bustling activity in the entire district. Upon the death of his father Isaya Mukirane in 1966, the then Young Mumbere assumed the mantle to steer the kingdom which had just a few years prior declared independence from Tooro Kingdom citing marginalization. 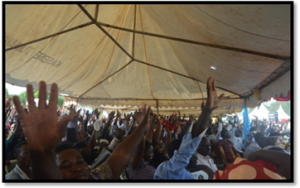 The highly attended function attracted hundreds of participants from various districts of Uganda, which included; Mubende, Busia, Bundibugyo,Ntoroko Nakapiripirit, Kabarole, Kyenjojo, Hoima, Bushenyi, Kampala, Wakiso, Mukono, Jinja and Wakiso. There was also a high-powered delegation of 250 people from the DR Congo. These came from as far as the Congolese Capital Kinshasa and other towns like Bunia, Butembo, Mangrijipe, Goma and the entire Eastern Congo. The function was also attended by a Central government delegation led by the Minister for Tourism, Wild Life and Antiquities Hon. Prof. Ephraim Kamuntu who represented the president of the Republic of Uganda. Other Ministers included; Prince Kibanzanga, State Minister of Agriculture, Hon. Peace Mutuzo Minister for Gender and Culture and the Leader of Opposition Hon. Winfred Kiiza. 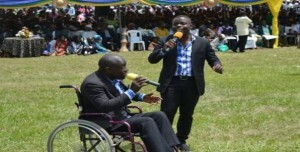 There were also five members of parliament including Hon. 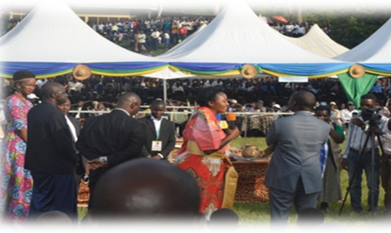 Anyakuni, woman MP Nakapiririti district,Karamoja Sub region who attended the function at the invitation of the Queen of Rwenzururu. 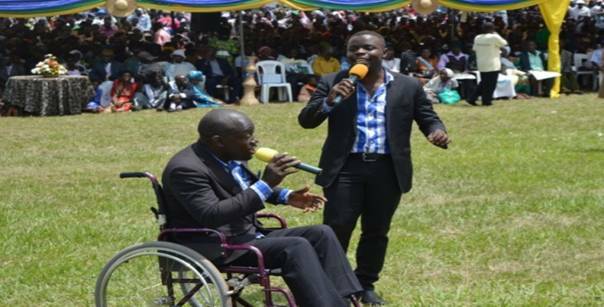 ‘I thank the Government for the development projects that have been implemented in Rwenzururu Kingdom. I continue to appeal for more interventions in the areas of Education, especially to support Rwenzururu Heritage University and to consider the construction of a referral Hospital that can save lives of the people who cannot be able to travel to Kampala for specialized treatment. Your Excellency, the upgrade of Kasese Airfield to an International Airport will improve tourism, marketing and create jobs for our people., And also I appeal for implementation of Presidential pledges such as the construction and upgrade of Kasese Airfield into an International Airport. Mumbere also called upon his people to work hard for the development of their Kingdom. Prior to the event KRC was requested by the organizers to make a presentation on cultural diversity and co-existence through forum theatre. Among the in turn contracted a group of celebrated local artistes drawn from Bakonzo, Batooro and Bamba/Babwisi Communities who teamed up to produce a collaborative song entitled “Okwikarana” literally meaning Living together. The presentation attracted a lot of attention from the crowd and it became a song of reference in all through since it condemned the barbaric generalcidal like killings, geo-cultural ethnicity and politicking but as well emphasizing the need for reconciliation, tolerance, harmonious living and peaceful co-existence. The various speakers at the function appealed to Local Radio stations to make the song a signature intro for various community mobilization radio programs. The artists were also requested to provide the Video for the song to enable various communities watch it and also opportunities where it can be performed live, repeatedly with ample time across the region. However, as expected, the issue of splitting Kasese became so contentious that various speakers hinted on it, with majority of the Rwenzuru loyalist (as seen from the photo below) against it. The loyalists believe the splitting of the district will weaken their kingdom as the other minority tribes once granted own districts are likely not to pay allegiance to their own cultural leaders. 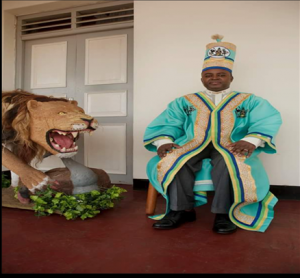 What so ever, Mumbere is our King !